The WARN VR12000 12,000 lb Winch is the large capacity offering of the new WARN VR Series (Vehicle Recovery) of winches. 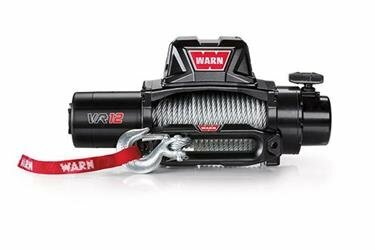 The WARN VR Series is aimed at both the first-time winch buyer and the person looking to save some cash, but still get a genuine WARN winch. With a stout 12,000 lb. pulling capacity and plenty of performance, the VR12000 is big on power and big on value. There is a separate control pack for various mounting options, has a series-wound motor for plenty of power and fast line speed and has an exclusive brake design for superior winching control. Exclusive brake design for superior winching control. Comes with a remote control with a 12' (3.7m) lead and 94 feet of 3/8" (28.6 m of 9.5mm) diameter wire rope. Low-profile design will fit most trucks and SUVs. Backed by the WARN lifetime limited warranty. View More In Pulling & Lifting.